The world is a little less bright today. 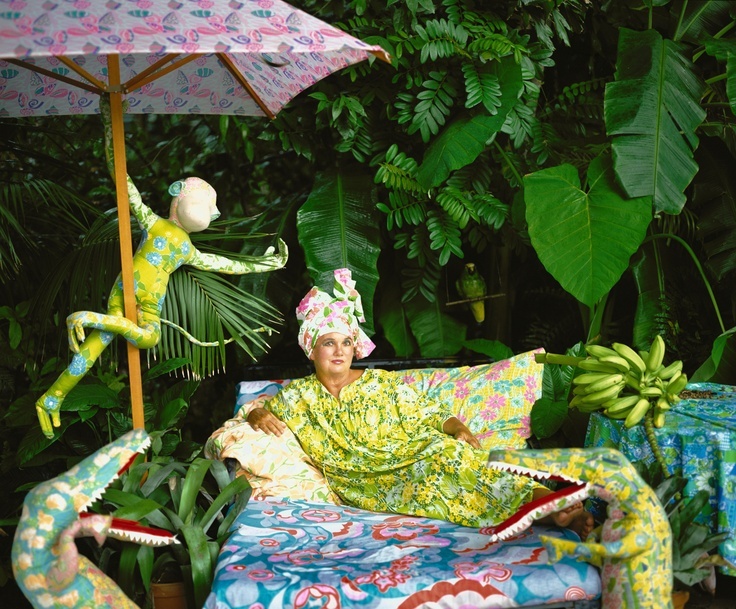 Lilly Pulitzer died this morning at her home in Palm Beach. 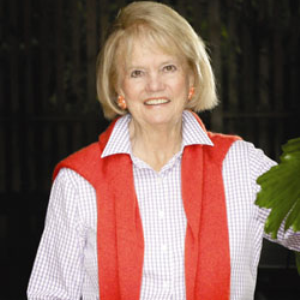 Early this morning, Lilly Pulitzer Rousseau passed away peacefully in Palm Beach, surrounded by family and loved ones. Lilly has been a true inspiration to us and we will miss her. In the days and weeks ahead we will celebrate all that Lilly meant to us. 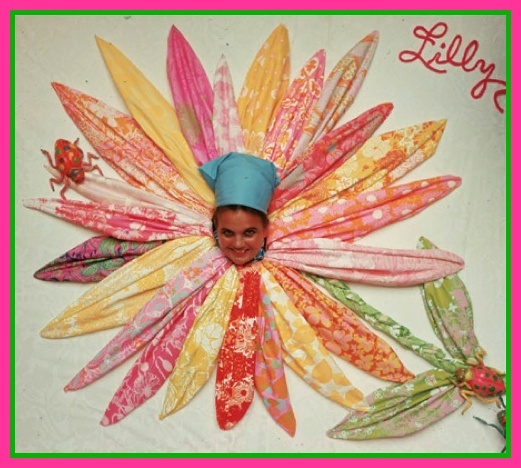 Lilly was a true original who has brought together generations through her bright and happy mark on the world. In search of a hobby after suffering a bout of depression in her late twenties, Pulitzer at first opened an orange juice stand in 1958 and then began developing brightly colored and boldly patterned shifts and blouses to help hide the stains created by her new enterprise. Pulitzer’s dresses hung behind her juice stand and soon outsold her drinks. A boutique featuring the company’s dresses — developed with the help of partner Laura Robbins, a former fashion editor — soon replaced the juice stand. Below we see Wendy Vanderbilt and a friend wearing their Lilly shift dresses in 1964. This offers a better view of a vintage Lilly dress. The dresses became a big hit in Florida and other resort communities. ….the accidental designer began selling the dresses for $22.50 apiece and couldn’t keep up with demand, aided by a designing couple at Key West Fabrics who helped conceive the lively colors, tropical print themes and other bits of whimsy that would become the brand’s signature. The fabric was made in Florida at Key West Hand Print Fabrics, TQM was fortunate enough to visit and watch textiles actually being created. Below we see a 1962 photo of a woman in a bespoke Lilly silk dress, in the background, Lake Worth. Lilly in a seashell dress. 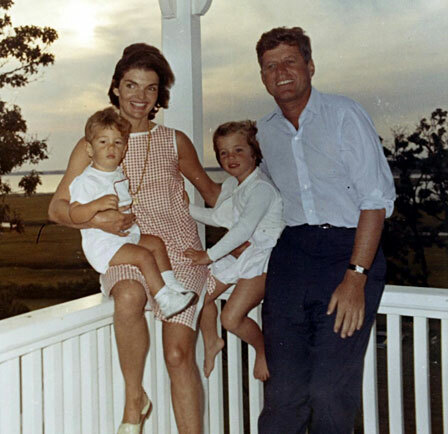 But the famous frocks weren’t really a national phenomenon until Jackie Kennedy was photographed wearing one on the Cape. Pulitzer’s tropical print dresses became a sensation in the 1960s when then-first lady Jacqueline Kennedy, who attended boarding school with Pulitzer, wore one of the sleeveless shifts in a Life magazine photo spread. And things really took off. Below, some early ads shared by on the Lilly Pulitzer Pinterest page. At the bottom of the photo lower left you might just be able to see that fabric was available for $5 a yard. Many early pieces were embellished with lace. This offers a more detailed view. A 1968 ad for the men’s line of clothing via Lilly Pulitzer’s Pinterest. And what men liked their Lilly? People magazine’s story has an answer. Men, too, got Pulitzer-ed, among them: author George Plimpton, comedian Bob Hope and football star Joe Namath, in wildly flowered pink-and-blue PJs (Pulitzer Jeans). Vintage Lilly menswear continues to be popular even now, this is a March post by the Necessary & Proper blog. But it was the womenswear that fueled the company, this is from a 1977 catalog. Lilly surrounded herself with color. Rich, vivid, vibrant colors. That remained true for womenswear, be it bell bottoms or a mini-dress. Lilly is private. Even her closest friends complain of how tucked away she keeps her feelings—“a sphinx,” one calls her. “Scorpio” is what she calls herself. “They do everything in excess,” Lilly explains, “but keep things very close to the chest. I’m not into horoscopes and all that, but it is telling. Scorpios hold everything in.” Just like the Lilly. When that whimsical shift is on, you can’t tell what’s happening underneath. 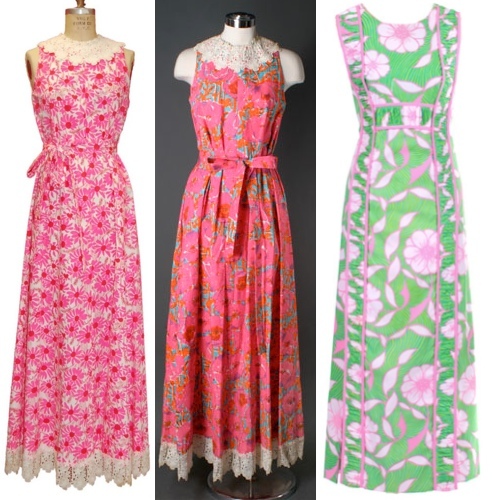 The Pink Pelican has a wonderful Vintage Lilly Pinterest board. By the early Eighties, however, the working-girl wardrobe and a neutral palette had taken over fashion; sales were flagging, and Rousseau shut the whole thing down in 1984. And then in 1993, the year her husband died, Rousseau was visited by Philadelphia businessmen James “Brad” Bradbeer Jr. and Scott Beaumont. There had been a generational shift, says Bradbeer, and the daughters and granddaughters of Lilly lovers were eager for those snappy prints and flatter-every-shape frocks. The love of Lilly did pass from one generation to the next. This photo from a 2009 Vanity Fair story shows Kathleen Kennedy and Rose Kennedy (L) in their Lilly, on the right we see Robert F. Kennedy Jr.’s daughters Kick and Kyra Kennedy in Lilly’s “Not So Crabby” print. Lilly remained an active part of the re-launched brand, providing consulting services to the rejuvenated label. “Style isn’t just about what you wear, it’s about how you live,” Pulitzer said in 2004. Lilly loved spending time with family and friends. Below, we see the entrepreneur in 2004 with her granddaughters, (l to r) Lilly Leas, Charlotte Pulitzer, and Emma Pulitzer, after presenting the brand’s 2005 spring runway show. Today the colors remain rich and spirited as seen in a group of Lilly Murfee scarves. “Today we celebrate all that Lilly meant to us and come together as Lilly lovers to honor a true original who has brought together generations through her bright and happy mark on the world,” James B. Bradbeer Jr. and Scott A. Beaumont, who bought the Lilly Pulitzer brand in 1992, said in a statement. “She sprinkled fun and pixie dust everywhere she went and was joyful right until the end,” said Kathie Orrico, a partner at C. Orrico, the specialty retailer that operates three Lilly Pulitzer stores and carries the line in its other four stores as well. “I saw her just last week and, just like always, she had cute phrases and words that inspired us to be bright and happy. That seems fitting, fun and pixie dust. New & Cool at the Princess *and* On Sale! Hello-Hello, welcome to a new week and our 5th Annual “I’m no Fool” Day here at The Prepatorium. It’s a good day for us to share some of our new and cool treasures, because *everything* is 20% off. We begin with some nautically inclined items. Below, our personalized layered Anchor Keychains ($33.95, $27.16 today only). With graduation, weddings and Mother’s Day on the horizon, a stellar gift idea: Personalized Engraved Pendants in multiple color combinations. Because so many of us already have too many chains to keep track of we offer the monogrammed pendants without the chain at $24.95 (today only $19.96), you can add a chain for $18 (with the discount today it runs $14.40). You get to choose what color you want for both the background and the actual monogram, there are twenty-two outstanding color combinations. Sticking with the personalization theme, this is just a sampling of items from our Fornash collection. Two of my favorite giftables from Fornash are today’s Pretty in Pink (and green! ), they are the Monogrammed Rings ($35, today only $28) that stretch to fit any size finger, and the Monogrammed Discs ($19, today $15.20), they come in such a broad array of color combinations you’re sure to find colors you’ll love putting together. The discs are ideal with the Fornash Charm Bracelet. You know we’re going to mention our exclusive Preppy Planet Phone Cases, our Bottom Line version is regularly priced at only $24.50, $19.60 with today’s discount. Below, more Pretty in Pink and Green. For those prone to dropping their phone, our Xtreme Tough Case offers a fabulous solution. 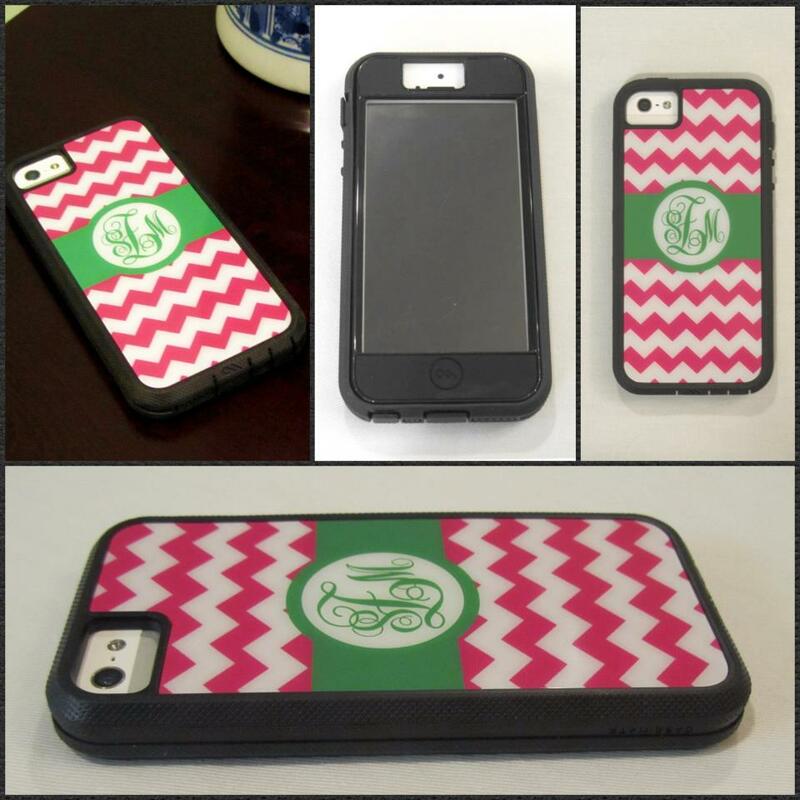 A happy customer shared pictures of her pink chevron tough case. Another great gift idea? Matching a monogrammed iPad/Kindle/Netbook/Phone case with one of our Tech Cleaning Cloths priced at $10, today just $8. Those same popular patterns are also available in Lilly’s spring iPhone 5 Cases ($28, just a bit more than $24 with today’s discount). Many of the spring prints come in the iPhone Case with 2 Card Slot, regularly $27.50, with today’s 20% discount, $22. There are several hostess gift ideas with the spring Lilly, including Coasters in Chiquita Bonita and Lucky Charms. The coasters coordinate with spring’s new Tumbler Sets (with a third pattern in the mix, Chin Chin). At $15.50 the reusable (top rack dishwasher safe!) tumblers are already a great buy, at $12.40 with today’s special pricing you can’t miss. Back to the personalization theme, all of our Clairebella goodies are 20% off, including the brand new Stadium Cushions, only $27.20 today. Next, a sampling of more monogrammed giftables. The Acrylic Monogram Earrings are just $39 today, the Personalized Pillows run $33.60 today and the Filigree Earrings start at $78, today only. With Father’s Day just a bit more than 2 months away it doesn’t hurt to at least start thinking about giftables with a masculine slant. If he isn’t fond of monograms perhaps the Coastal Life cufflinks series ($28.95) might be the very thing. A Monogrammed Toilet Kit (The Consort calls it a Dopp Kit…?) for $29 will fit almost any budget. Our Personalized Phone Cases start at just $24.50 for the Bottom Line version, the group shown on the bottom of the graphic up above is from the ‘Bespoke Suit’ collection. Our Ready To Go cases for iPhone 4 and 5 are just $14.80 with today’s discount. And one final gift idea. The ever so nautical jewelry from Pink Pineapple. We want to share a look at our complimentary gift boxing. We are also happy to wrap packages at no charge, with any style paper you like, from Lilly Pulitzer to Jonathan Adler to more conservative papers. That’s it for today’s shameless self promotion, happy day to all! Hello-Hello and welcome to the Prepatorium. Today we have some Friday Fun targeted a little closer to home, we are going to share some of the wonderful new products we have added at The Princess. There are so many new treasures we have had to split the post into two parts, today we have the first portion. We begin with word of a line we are *very* excited to offer, the Pomegranate Collegiate Collection. Behold, the official plaid of the University of Florida. The motifs adorn all manner of items, from tote bags and duffels to tablecloths and oven mitts. All patterns and designs are officially licensed by the NCAA, here are a couple of items in the UGA (University of Georgia) group, the Tablecloth (2 sizes, $36, $64) Napkins and Koozie ($12). Jayhawk fans will be pleased to see the University of Kansas collection. All of the patterns are not plaid, here are some of the items in the official Alabama paisley group. There is an enormous selection in the University of Kentucky plaid, including the Cotton Scarf ($28), D-Ring Belt ($30), and Picture Frame ($22). The final group we share from this line is the Louisiana State group, below we show the all cotton Tablecloth (2 sizes, $32 or $64) and cotton Napkins ($28). Don’t despair if you do not see your school here, Pomegranate is adding more as quickly as possible. Next to join the collection? The Vols from Tennessee (Hello Preppy 101!) and Sooners from Oklahoma. Also new, our Clairebella Greek gifts and goodies. The line is currently offered for 17 different sororities, items are priced $17.50 to $55. Items in this collection can be done in any color and almost any font you choose, there are lots of options. Below we share one last sorority, this one on behalf of TQM. That’s not all that’s new from Clairebella this fall, here are the new ‘preppy’ designs by Kathy Denness, the brains behind the beautiful patterns at this company. The new patterns are available on all of our Clairebella products, including the personalized Phone Cases, Cutting Boards, Platters, Melamine Trays, License Plates, Clipboards and more. Another addition that also makes an ideal gift, our Personalized Mugs from Lovie and Dodge, $24.50. Not only do they offer a snappy Halloween polka dot, there are several more masculine designs, a possibility for Dad this Christmas or Hanukkah? Next on our list of new and fun finds here at the Prepatorium, our stationery that matches the oh-so-preppy icons on the 2012 Preppy Calendar ($12). Here are some of the Preppy Calendar Flat Cards in two of my favorite designs, the Plaid Woodie from the month of March, followed closely by January’s Knotted Anchor. Of course the delightful designs are by the very talented Shannon of the Preppy Ladybug, she created all of the artwork for the Calendar. She has also created these snappy Preppy Calendar Address Labels ($4.50 and up). We show the Argyle Christmas from December (you know you need some of these! ), May’s Seersucker Tote and the Polka Dot Wellies from April. There are also darling Foldover Note Cards, we don’t have them all on the site yet, they should be there before the weekend is over. Our final item today, can you guess what it is and who is all excited about it? That’s right, Silly Tilly is all gaga over her new Jonathan Adler dog mats, only $12.50 and very durable, the mats come in four vibrant designs. Our wildly popular Lilly Pulitzer Agendas are back in stock, we have them in both Large and Pocket size in several of this year’s patterns. On that note we say goodbye until next time, may your weekend be wonderful! Proudly made in the USA, the Calendar offers twelve months of oh-so-preppy designs, some readers may recognize the deft hand and fabulous artwork of Shannon, the creative whiz behind The Preppy Ladybug. Argyle, madras, and seersucker patterns are all part of the Calendar, it comes in a clear acrylic case that converts into an easel so it sits perfectly atop your desk, or anywhere you want to put it. Best of all? The price. It is just $12 and comes with our signature grosgrain ribbon tied around it, so it makes good gifting for the preps on your list. The Calendar is available now at The Princess or at The Preppy Ladybug. Do forgive us if we’re a little goofy over our newest product, we have been working with Shannon on it for so long we are tickled to actually see it on the site! Well now, if it isn’t a Monday. In every way. 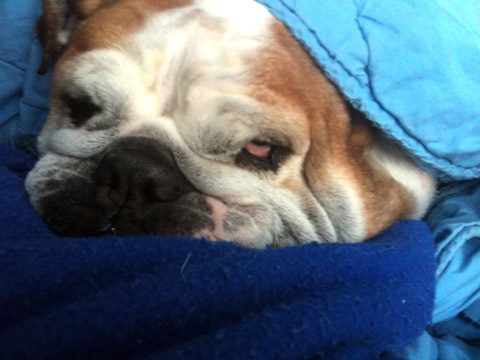 Even Tilly is feeling it. Because we are slightly overbooked tomorrow (Tuesday), unfortunately today’s blather post shall have to suffice for both days, we do apologize for our appalling lack of time management skills. We begin with what is becoming an almost weekly event, another in the Sunday night parade of celebrities showing their party frocks, jewels and accessories as they head into yet another awards show. (If it is all so very wretched then pray tell, why dost thou engage in adding fuel to the frenzy, hello?!!) Last night’s venue was the Screen Actors Guild Awards. We thought Nicole Kidman looked lovely in black lace by Nina Ricci, although we are apparently in the minority, at least from what we gleaned in this morning’s reviews. Diane Baranski from The Good Wife was radiant and True Grit’s Hailee Steinfeld was very pretty in Prada. Several stars were in Oscar de la Renta, including Jennifer Lawrence (below left), nominated for her role in Winter’s Bone (the movie was quite the sensation at Sundance last week), she was in a shocking pink gown from the designer’s pre-fall 2011 collection. Above right Glee’s Lea Michele is also wearing OdlR, a blush crepe de chine dress from this spring’s collection. We enjoyed this next picture via PopSugar, the young stars of Modern Family: Rico Rodriguez, Ariel Winter and Nolan Gould all looked darling. Not looking as stellar as she generally does, Jane Lynch from Glee missed the mark in a bouffant lavender creation. On a more positive note, Jeff and Susan Bridges provided a note of understated elegance. Also on the “misses” list and understandably so, Angie Harmon. All the Rage offered this on Ms. Harmon’s dress: “… Monique Lhuillier that looked as if it were about to molt”. Ouch. Anti-Prep Kim Kardashian’s Marchesa gown was labeled both a hit and a miss, depending upon whom you were reading this morning. 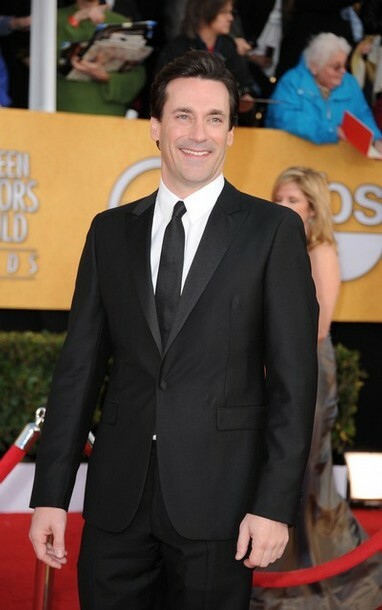 We liked Mad Men’s January Jones in Carolina Herrera, but did not find her highly styled hairdo nearly as fabulous or flattering as most others did; as always, co-star Jon Hamm looked stylish. That is the sort of thing you like to read about, as opposed to the plethora of “stars behaving badly” stories we so frequently see. Our other topic today is fun, albeit crassly commercial (gasp). We are all gaga over our brand new personalized iPad and Kindle cases. Above we show three of the patterns available, definitely today’s Pretty in Pink and Green. Below, two of the argyle designs available. The cases come in two versions, one for the Apple iPad (10″ x 7.5″ x 1″) and one for the Kindle DX (11″ x 7.75″ x 1″). One of our personal favorites is the Sailor Plaid in red, white and blue, although the Rhapsody Stripes make us think of deep turquoise waters and blue skies. The cases are crafted of durable neoprene and may be monogrammed or personalized in a variety of ways. We couldn’t be happier to offer Lovie and Dodge, these are precisely what we were looking for after acquiring our very own iPad, and we will have more goodies from this splendid company moving forward. We know many readers probably aren’t sleeping well, overwrought by concerns about precisely what Prince William will wear for his trip to the altar in April. Put away the sleep aids, tonight you can snooze in bliss, comforted in the knowledge that question has been answered. The Prince shall be in uniform, Savile Row firm Gieves and Hawke is making his suit. It isn’t yet known if he will opt for a Naval, Army or RAF uniform; the Prince is eligible to wear any of the three. Now if we only knew about Miss Middleton’s wedding gown designer….sigh. That news will come soon enough, the media are camped out simply everywhere trying to get the upper hand on the story, but the family and the varying Palaces involved are managing this one rather well, good for them we say. On that note, we say goodbye until next time, may everyone be safe and warm and dry. Hello-Hello, happy Pink & Green Monday! Today we must engage in crass commercialism, oh yes indeedy, reminding shoppers that goodies at TPP are 20% off until midnight tonight. That means no matter which team you were pulling for, you can fly your colors at a great price with our Personalized Collegiate Garden & House Flags. …are a great gift with monogram options like these whales, just a few of the many choices. Personalized Plates and Platters are always a welcome gift, as are our Clairebella Cutting Boards. Bright , whimsical lunch bags and Eco-Totes make nifty stocking stuffers. It’s a great time to do Calendars and Agendas, including our Susan Wallace Barnes and our Cutie Calendars. Greek goodies always make a nice gift, especially when they are as reasonably priced as our Donovan Designs note cards, luggage tags and notepads. And you know our Lilly Pulitzer collection offers amazing possibilities for presents. Jonathan Adler and Kiel James Patrick can help in those “Hmmm, what should I get?” situations. Our Boat Totes become an even better value with the discount, as do out other Totes and Bags. But our hands-down, all-time best value remains our Custom Key Fob ($6 before the discount! ), you get to pick the ribbon and the backing. These are just a few ideas – if you don’t see what you need or have questions, just email (ThePrincess@PreppyPrincess.com) and we’ll do everything within our power to help find the perfect gift for those on your list… and don’t forget a little trinket for yourself, after all, who is more deserving? 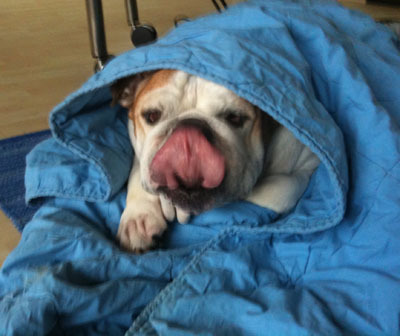 We leave you with Silly Tilly’s thoughts on the Thanksgiving holiday. Until next time, we hope your shopping carts are filled with fun and joy.